Making comments at a City Council meeting. Times are set aside at each meeting for comments about agenda items or about anything of interest to citizens. Submitting written comments to the City Council. 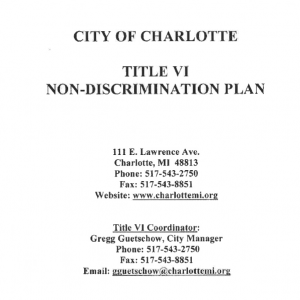 Letters addressed to City Council can be sent to 111 E. Lawrence Avenue, Charlotte MI 48813. Comments can be submitted by email to webmaster@charlottemi.org. You can send an email to one or all City Council members; their email addresses are listed here. For additional information about offering citizen comments, please see Council Policy 2016-02.